These are the AMain Hobbies colored stickers, designed for your car, buggy, truck, plane, helicopter and wherever else you want! Don't worry about being seen, these large 6.25" x 5.5" inch large stickers are made from transparent vinyl and feature a nitro resistant coating to remain durable even in harsh conditions. Share your AMain Hobbies love with friends and family, or show it off to the competition! 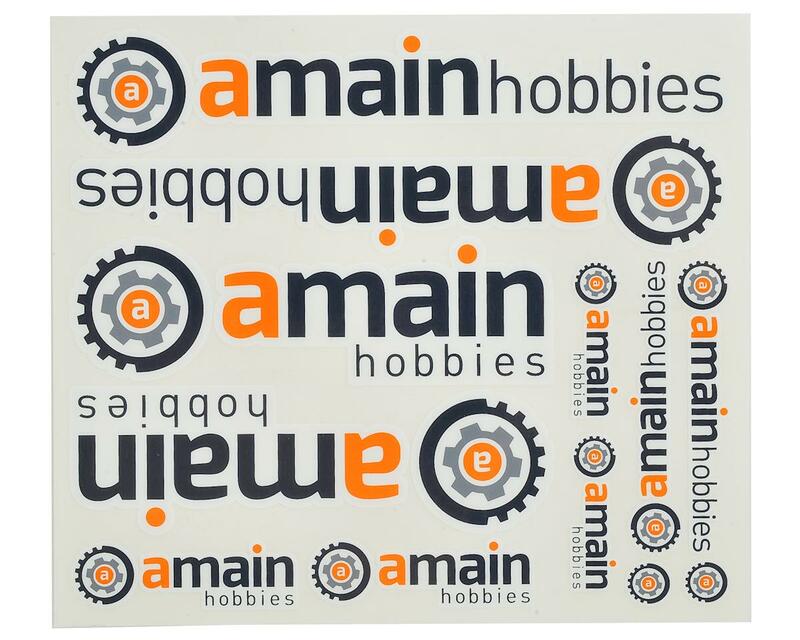 Grab an AMain Hobbies sticker sheet. 18 of 21 customers found this review helpful. I totally agree with the previous comment.. I really think these companies should start putting a small decal sheet or maybe 1 or 2 decals in each order.. with Ebay,Amazon and now even Walmart selling rc parts.. One would think the companies would take all the free advertising they could get.. esp. with folks decking out their bodies and racing with them. Just my 2 cents. These stickers are so awesome! I trimmed a few decals and dropped them on my racer and BOOM! My laps instantly dropped a tenth! Thanks AMain.